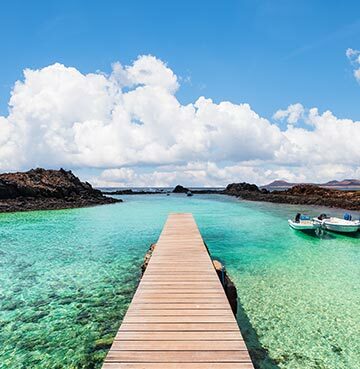 One of the dreamiest destinations when it comes to beaches is fabulous Fuerteventura. Miles upon miles of unspoiled white sands sprawl out across the shoreline. Like a kid in a candy shop, it's hard to know where to begin! Whether you're a nature-lover, thrill-seeker, seaside stroller or watersport worshipper – one of the 80 blissful beaches are bound to be just what the doctor ordered. Unwind in an unforgettable landscape and experience rugged, wild beauty at its best. Here's our top picks for the best beaches in Fuerteventura. One of Fuerteventura's great beauties – this beach boasts pale golden sands, wonderful watersports and awesome attractions. There's an unlimited supply of family fun thanks to the entire town being geared towards tourists and visitors. The promenade along the beach is lined with palms and places to eat – where you'll be able to sniff out Spanish delicacies and international dishes in no time. As for the beach itself, gently sloping sands head into the sparkling sea, making these shores some of the safest on the island. No wonder it's such a hit with young families! Set in a privileged position on the east coast, Caleta de Fuste is nicely cocooned from any trace of the wild Atlantic waves. Inviting swimmers and splashers alike to enjoy the warm, calm waters. This beach wrote the rulebook on low maintenance and laid-back holidaying, so it's no wonder that visitors return year after year! A must-see made up of broad sandy beaches and the biggest dune spread in all of the Canary Islands! Stretching out for six miles, the sheer length of these sun-baked sands mean there's no worry about being shoulder to shoulder with strangers. 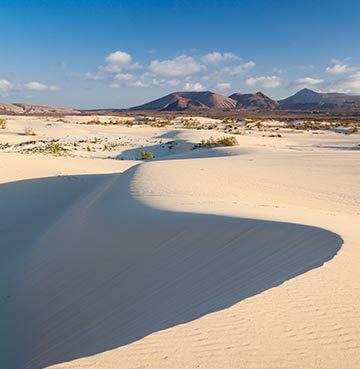 Corralejo Natural Park is where you'll find the delightful, distinctive desert beauty of Fuerteventura. The neighbouring resort itself is one of the islands largest and liveliest. Parents can rest assured (as with most major beaches on the island) lifeguards are watching over beach-front frolics, so enjoy peace of mind knowing your water babies are safe to splash the day away. Sotavento Beach – surfs up! Sweeping shores extend a stunning 17 miles at Sotavento Beach, making for the perfect place to enjoy endless strolls next to crystal-clear waters. Sea temperatures here are a gorgeous 21°C year-round, wonderful news for both water babies and watersport enthusiasts. A sand barrier has created a natural 3km long lagoon creating perfect conditions for first time wind surfers. 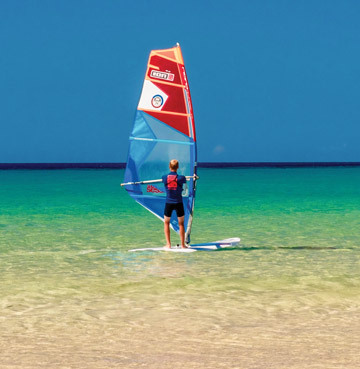 Famed for watersports, the beach is one of the best of the bunch when it comes to kite surfing. Thanks to strong trade winds both beginners and more seasoned surfers can take to the seas! The wind here is substantially stronger than anywhere else on the island making it the perfect setting for the sport. So what're you waiting for? Surfs up! For something a little different from Fuerteventura's white-powder sands, adventure to awesome Ajuy. Brilliant blue waters set against jet black sands most certainly make for a striking sight. Add in a spectacular sunset or two and this small fishing village should definitely earn a spot on your holiday schedule. Here you'll find some of the oldest rocks in the Canaries, another string to Fuerteventura's bow when it comes to beating out competition from its island neighbours. 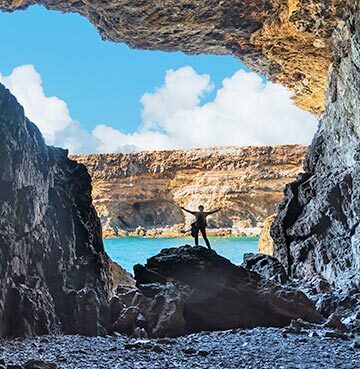 North of the beach itself are the characterful Ajuy caves. Accessible via a coastal pathway, the walk is easy-going and serves up spectacular sea views for those who embark on the short stroll. Admire the ocean from up high and watch as the swelling water takes centre stage. The caves are free to enter and well worth a visit. Once back at the beach make the most of your stunning surroundings and sprawl out on your towel – these sands are great for a good sunbathing session! Pegged as the perfect place for contemplation, this genuine piece of paradise is just 10 minutes away from Corrajelo by ferry. Laid-back beach lovers will be lost in awe and wonder at the rugged beauty of Lobos Island. Snorkelling is irresistible thanks to waters teeming with wildlife and the crystal-clear quality of the serene seas. It only takes a few hours to make your way around the island and explore the entire nature reserve – which means plenty of sunbathing time on the secluded beaches! Be sure to load up on snacks, suncream and supplies before you head out as there's little in the way of facilities on Lobos itself.